Our country relies on entrepreneurs and small businesses to create economic growth and build strong communities. When nearly 29 million small businesses in the U.S. employ nearly 60 million Americans, their financial health matters to all of us. These engines of economic growth are responsible for 63% of net new jobs over the last decade, but are struggling financially in a myriad of ways. The Center for Financial Services Innovation – the national experts on consumer financial health – sought to understand the connections, similarities, and differences between consumer financial health and the financial health of small businesses. Our definition of financial health for a small business is the same as for an individual consumer: Financial health comes about when your daily systems help you build resilience and pursue opportunities. But are the needs of the small business being met? Are the products and services they use supporting the financial health of the small business? 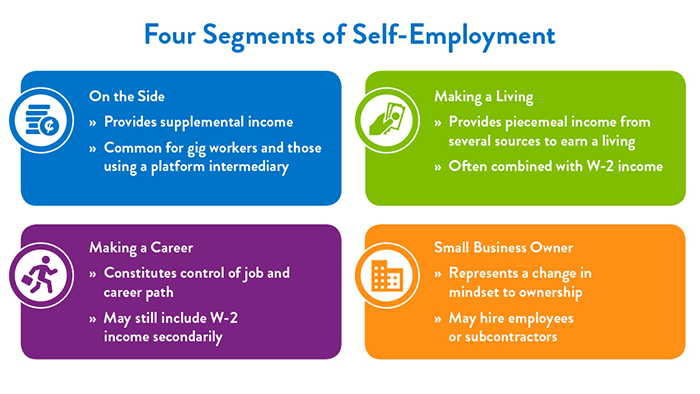 We found that small businesses and the self-employed are a diverse group with a common experience: the U.S. financial system is not built for them. Millions of Americans need solutions that recognize the interconnected nature of the individual and the small business. Yet they often must navigate a complex tax and financial system using financial products and services designed either for consumers or larger businesses. These elements provide a starting place to identify and assess gaps in products, services, and support for small business customers. By addressing these challenges and others, providers have the potential to improve the financial health of millions. We consider this to be a work in progress and invite you to contribute to our thinking and help us turn these initial concepts into practical applications. Our vision is that through further testing and refinement, we can better understand these elements and create a toolkit for providers to successfully measure and improve the financial health of small businesses and the self-employed. Download the paper and use these elements to understand the financial health of the small businesses you serve. 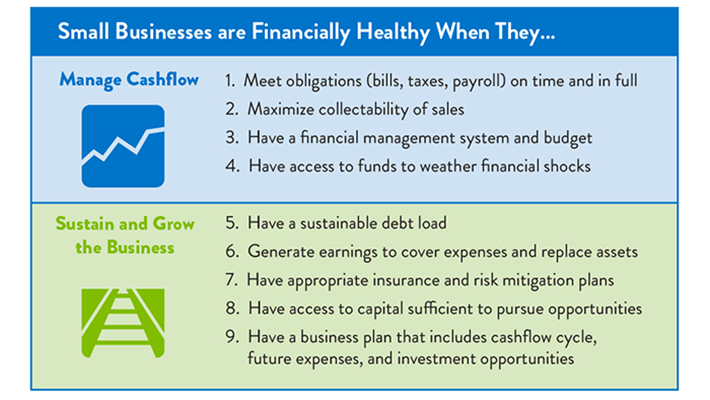 Intuit is the founding sponsor of the Small Business Financial Health Initiative. The Intuit Financial Freedom Foundation sponsored the research for this paper. The authors would like to thank the numerous financial services providers and other organizations that contributed to this report by providing feedback and suggested resources to inform this work. Specifically, the authors would like to thank all participants of CFSI’s Small Business Working Group for their contributions. Founding sponsors of CFSI’s Small Business Working Group include Capital One, Intuit, JPMorgan Chase & Co. and PayPal.